When will I get my order? : Orders are processed in 2 weeks. Then refer to this map (Click here for map) to calculate the additional shipping time. Your favors ship from OH. 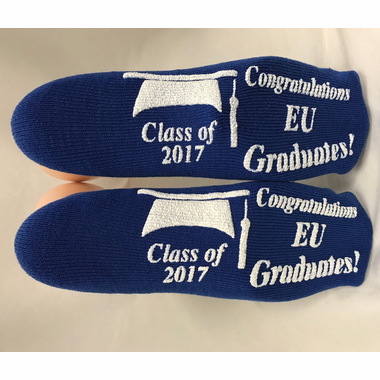 These non-skid graduation grippy socks, personalized for you, are the latest rage! Everybody loves receiving these. They look great, are so comfortable - and they even have the 'non skid' safety feature. 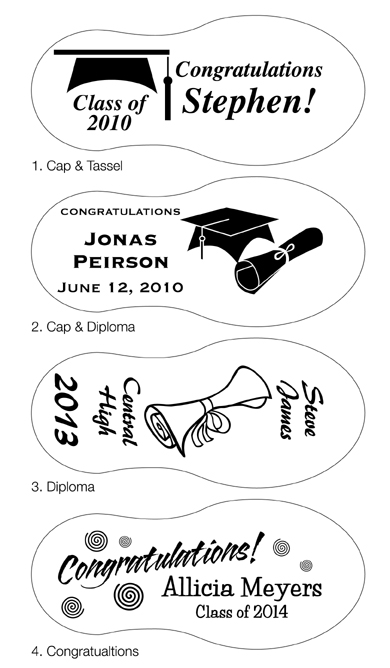 If you are looking for a unique, personalized graduation favor - this is it! They feature your message, and if you chooce, a graphic of your choice as the non-skid safety tread on the sole of the sock. 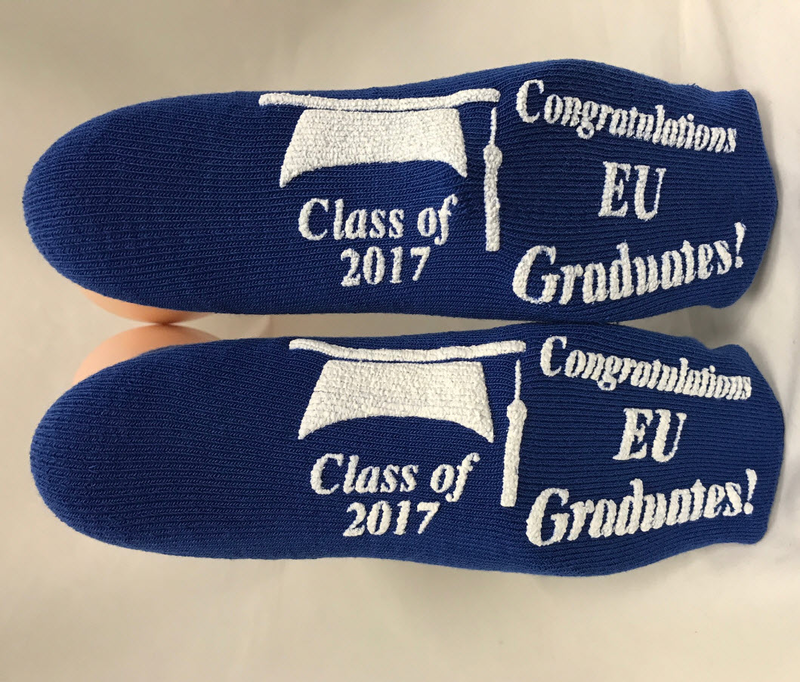 These socks, which are also used by hospital personnel, are made of terry cloth and are machine washable. 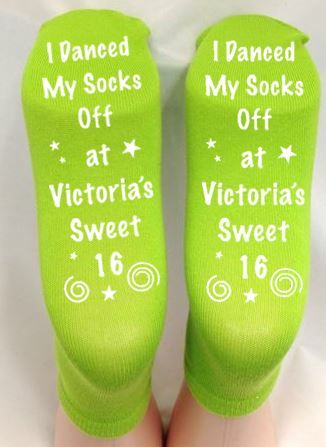 The tube style socks are an adult one size fits all and will not fit children under age 10 - teens are normally already in adult sizes so they work for teens. They are not a tennis style sock which goes to the ankle. They are considered 'half calf' (to come up near the calf) depending on the foot size of the wearer - it may come up a bit higher for smaller feet or a bit lower on larger feet. 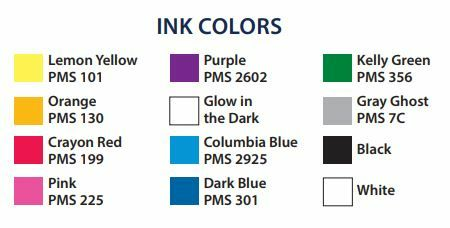 Due to different computer monitor settings, please be advised the color charts for the socks and the imprint colors are not necessarily an exact match as they appear on your screen. If you have concerns about the size or color of the socks, please request a free sample. Designs shown on this page are included in the price. If you would like our graphic design artist to create your own unique design, we would be glad to do so at an added cost of only $25 which does includes ONE proof change. The design will be emailed to you for review and approval before the order can be booked into production - we will need your prompt response to the art email to proceed with your order in a timely manner. If you have a logo you would like to use, feel free to email it to us for review so we can determine if it will work. 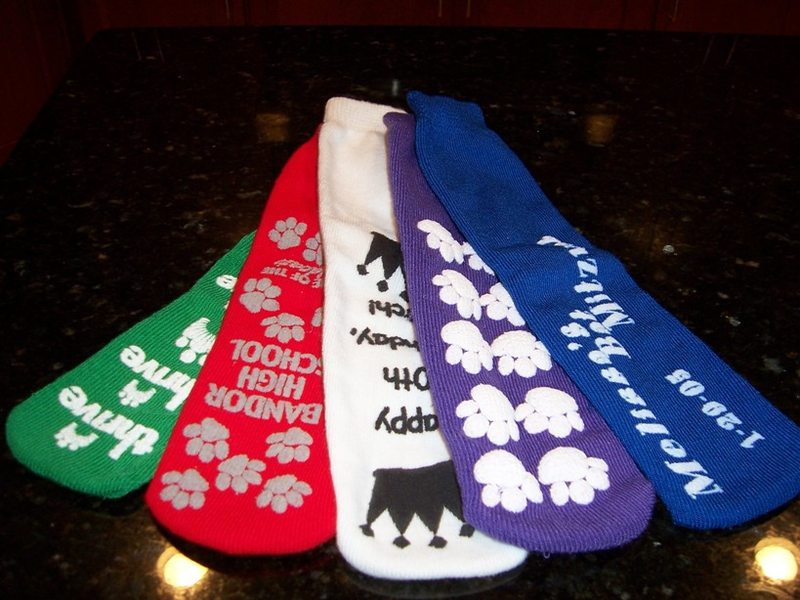 You may request a pair of a grippy socks, at no cost, in the color you are interested in ordering. However, the sample you receive will have a design already on it. Please send us your contact information and write the words "Complimentary Grippy Socks" in the Subject Line. Click here to send us your request: info@cool-party-favors.com.